It's got the style but it's not quite got all the features - although, arguably, that's where this sub-£300 advanced compact is supposed to exist. The XZ-10 is like the "XZ-2 mini" and although it packs slightly less of a punch due to lack of lens-based stabilisation and a standard size 1/2.3-inch sensor, we're otherwise impressed with what this stylish little number can do. 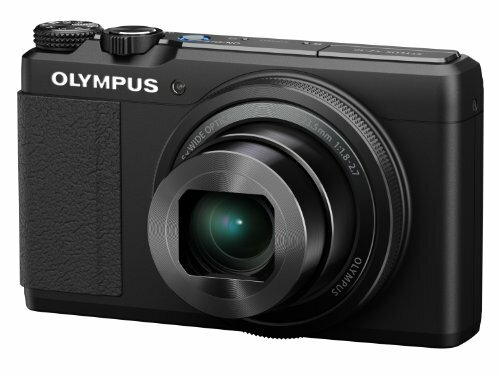 At first glance the Olympus Stylus XZ-10 looks like a shrunken-down version of the comapny's top-spec XZ-2 compact. But it's both more and less than that: this middling advanced compact is a curious mix of high-spec - thanks to raw capture and the inclusion of a brand new 5x optical zoom lens with f/1.8-2.7 maximum aperture - found among more standard fare such as the small 1/2.3-inch sensor size. The XZ-10 looks to be the bridge between standard and larger-sensor compact cameras. And it sure does look a beaut. Is this metal-bodied Stylus the right direction for Olympus' range and, indeed, can this brand new model hold its own in the ever-growing advanced compact camera market? Olympus hasn't really pushed its Stylus brand much before. The XZ-10 changes that: brandished with the designer font "Stylus" logo to the rear as well as on top of the pop-up flash, stylish - rather than Stylus - is a word we'd opt for. And although the XZ-10 is understated in its design, it's the combination of metal body, slender form factor and smooth edges that keep it from looking too industrial and brash. In the last few years Olympus has succeeded in establishing itself as a bit of a style icon in the camera world thanks to the launch of the digital Pen and OM-D series of cameras. Both model ranges combine a retro aesthetic with modern-day tech. While this Stylus is not a Pen - that's almost confusing by dictionary definitions, right? - it sure does look top quality to us. The camera has a variety of control dials, including a mode dial on top of the camera and - our favourite - a physical control ring around the lens which can rotate in both directions. This lens ring doesn't offer the dual-function of the XZ-2 - which included a smooth rotation for manual focus as well as the "click-in" option which features here - but it's still apt for quick adjustment of aperture settings and the like. It's positioned well to get an easy grasp of it too - not too thin, not too thick for the fingers. Other buttons are reflective of a fairly standard compact camera design - again a balance of function to style; there aren't dozens of function buttons strewn around the body, instead it's just the one Fn on the rear next to the rotational d-pad control. The camera's lens is controlled as per many other compacts via a zoom toggle around the shutter button on top. It propels the 26-130mm equivalent optic through its paces at a steady speed. We're keen to see a broader-than-XZ-2 26mm equivalent wide-angle, but that can still feel a touch limiting for those extra wide-angle shots - a 24mm equivalent would have been a nicety, albeit one that would probably have introduced additional corner softness. Elsewhere the lens does a grand job of squeezing such a bright aperture range into a slender body. With a wide-open f/1.8 aperture at the widest setting, dipping to a still impressive f/2.7 at the longest focal length, there are immediate benefits to this: more light can enter the lens to keep shutter speed down for hand-held shots in low light, while creative control of background bokeh (otherwise known as background blur) is enhanced compared to many lesser compacts. Jostling the aperture value via the up and down keys of the d-pad on the rear does feel a little alien as it's very easy to accidentally adjust exposure compensation instead, but that's the Olympus way - and it's something that eventually sticks. However, if there's one big omission form the lens's specification then it has to be the lack of image stabilisation. While the sensor is able to shift to counteract handshake, there's no way to benefit from this during preview composition of a shot. And we really felt it in use, and not just in dimmer conditions. Some excessive wobbling on screen wasn't ideal and made us reshoot a number of frames. Over the week that we've been using the XZ-10 for it felt a familiar experience: in use it's a lot like the XZ-2 with fewer on-body controls. Now that's a good thing. When it comes to autofocus there's a user-selectable 35-point autofocus array is arranged in a grid fashion and can be quickly brought up - assuming correct AF mode is already selected - via a left press of the d-pad. Our preference was for the centre point to take pride of place for the majority of snaps where it proved snappy for the most part. The 3-inch 920k-dot LCD screen on the rear is also touch-enabled which means hands-on controls are never far away. Press to focus, press to shoot, or press to turn the touchscreen off. The choice is yours. It's a welcome feature, but shooting with the camera in a single hand while using the other to press on the screen doesn't make for the steadiest of previews - that's the lack of lens-based stabilisation rearing its head again. Of course the camera can also take full autofocus control instead if preferred and there's also a face detection option which we found to be successful - surrounding in-shot faces with a focus box to confirm. Even when shooting raw files we never found the write speed to be an issue with a Class 10 SD loaded up. The five frames per second burst mode won't immediately render every shot, but a short wait is nothing to worry about. Battery life delivers around 200-250 shots per charge, we found. Not great, not awful for a camera of this size - but if you want more then you'd best look elsewhere. The big one - how does a standard-size sensor sit in a more advanced shell? Nikon's P-series is a prime example of just that. Or it was until recently - the latest P330 comes equipped with a larger 1/1.7-inch sensor size. Olympus already has that base covered in the XZ-series, but is the choice to downscale rather than heading towards a larger 2/3-inch or similar sensor the right decision? First thing to note is that the XZ-10's 12.1-megapixel resolution doesn't have its head in the clouds as per so many number-crunching compact cameras. Olympus has often resided in the 12-megapixel ballpark and we think it's the right choice - more space per "pixel" on the sensor surface should result in better images quality overall than a more standard 18-megapixel competitor. Which is the case - or at least it is some of the time. See, the XZ-10 is a bit of a mixed bag in the image quality department and that's partly on account of its lens. Wider-angle scenes had a tendency to be a little soft even when shooting in good light and at fast shutter speed, while close-up shots with a little zoom used and at around the f/2.5 aperture mark offered up some crisp results. In terms of colour and exposure we found the XZ-10 opted for a fairly conservative, even muted palette the majority of the time. That natural look works well in prints, but if you want a bit more colour saturation then have a thumb through the options where vivid and other settings are also available. Or playaround with raw files in post-production for tailored results. Indoors we found the white balance to be quite the opposite - full of orange/yellow which wasn't dialled out by the camera's auto white balance. When shooting in low light the camera rarely opts to push the ISO sensitivity up. We had blurred night portraits as the camera capped the sensitivity at ISO 800 when an extra stop or two might have been more appropriate. At these mid-high ISO settings results are still reasonable - not to the standards of the XZ-2 by any means though, and there's definitely grain and coloured image noise to be seen in shots, but not to the point of total destruction. For a 1/2.3-inch sensor size the XZ-10 does a good job, but in the same breath it doesn't get us super excited either. Shots aren't the best going, but they do the job - it's the appeal of the wide aperture controls that goes some way to keeping shots at their best, particularly at the lower ISO settings. As ever with an Olympus release there's a variety of Art Filter options built in for in-camera filter adjustments, and even a new quirk in the shape of Photo Story where pre-set frames can be selected to arrange multiple shots as a single shot. Fun, particularly as it's all handled in camera. Slender and stylish, the XZ-10 leaves a good first impression - but the trim design not only cuts the fat compared to the top-spec XZ-2, it also pulls back on some of the more advanced features more commonly associated with an advanced compact. There's no lens-based image stabilisation, a standard 1/2.3-inch sensor size, so-so battery life and no hotshoe expansion for a viewfinder are some to mention. But perhaps that's being unfair: the XZ-10 isn't trying to replace the XZ-2 or competitors such as the Panasonic Lumix LX7. Instead it's a (sort of) new concept that delivers in terms of size, build, and other advanced areas such as raw file capture and a built-in neutral density (ND) filter to make best use of that bright lens. But for all its good, it's the pictures that lack that extra buff of polish. Some shots we took were great, while others were a little soft - as the lens seems to introduces optical issues - and the standard sensor size can't quite match up to its larger rivals. Then there's the question of price which, at £299, is affordable - but is more than the larger-sensor Nikon Coolpix P330. Conundrum indeed. We think the XZ-10 delivers aplenty, but one or two shortcomings are present too. Then again we'd buy one just because it looks quality - and that'll have a bearing on its popularity too.